After almost 2 weeks of not watching a movie in the theaters (I did not see last week's Insidious: The Last Key due to various reasons), I finally went to the cinema again yesterday when this movie premiered. 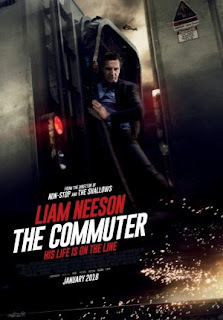 I am a fan of the latter Liam Neeson's movies which usually translate to some cool actions, so my wife and I had been eyeing to see this one. It so happened that my wife's cousin & his wife also love to watch movies and asked us to join them watching this together. And the four of us went to see this in the Premier class at Lotte Avenue while enjoying our dinner (thanks to them both for the treat!). Anyway, let us go on with the movie. Michael MacCauley (Liam Neeson - Schindler's List, A Monster Calls, Taken trilogy etc) was an insurance agent who had to commute by train every day from his home to his work place. This had been going on for the last ten years and hence he basically recognized most of the other commuters as well as the train conductors. He lived with his wife Karen (Elizabeth McGovern - Downton Abbey TV series) and son Danny (Dean-Charles Chapman - Game Of Thrones TV series). Before working as insurance agent, Michael worked as police detective with his former partner Alex Murphy (Patrick Wilson - Insidious, The Conjuring etc) and captain Hawthorne (Sam Neill - Jurassic Park, The Tudors series etc). One evening while going back home in his usual train, Michael was approached by a mysterious woman named Joanna (Vera Farmiga - Up in the Air, The Conjuring 1 & 2, etc) who gave Michael a simple task and in return he would be rewarded some cash. The task would be to find a person in the train who did not belong there with very few clues, and if he could find the person before the last stop of the train, he would be rewarded with a larger sum of money. Michael was intrigued but as we would soon find out, the task was not as simple as it should be. He would be caught in a dangerous cat and mouse game where his and other people's lives would be put on the line. So could Michael complete the task? What would he entangle while doing so? And could he do it in such a short time? Find them all in this intense action thriller movie. It has been a while since I last saw Liam Neeson's action thriller. I think the last one was Taken 3 which though I loved, but not the best of the trilogy. So it was rather refreshing to see him here again doing what seemed to be his best genre, i.e. an action thriller. What was wonderful about seeing him was Liam Neeson had such a commanding presence on screen that it felt whenever he was in a movie playing a tough guy, he really nailed it. In here, he played a character who was being suppressed so hard that he had no choice but to fight back, and boy he really fought. As usual, he would be able to do the fight skillfully but not in the very fast style a la Jason Statham or Donnie Yen but his own style which was brutal and kind of like a street fight. In here, all the fights done were good, but my most favorite would definitely be the one in the small compartment before the final stop. Apart from the cool fight scenes, there were also various intense moments involving the train. The train's high speed sequence towards the end was absolutely breath taking and so intense that I was literally holding my breath. And I know my wife also screamed a little during some of those awesomely done intense moments. This time, the movie did not have too many funny moments, apart from some brief comments towards the end of the movie by other commuters. For a movie that was shot mostly in a confined space of a train, the early part of the film was a bit too long to my personal opinion. This resulted to a bit of a slow pace at the start. Not until the scene in the train did we feel the movie picking up the pace. Personally I think that if the earlier part was made a bit shorter, the movie would have been a nonstop thrill. To tell you the truth, I also felt a bit of similarity with another Liam Neeson's movie Non-Stop where the scenes were mostly done in an airplane. This should not come as a surprise since both were directed by the same person Jaume Collet-Sera who also directed few other Neeson's movies such as Unknown and Run All Night. Jaume's style of making thrilling intense movie was pretty good as proven when he directed the shark thriller movie The Shallows. I found that the sound effects of the movie was excellent and the special effects were good. It also provided us some twists and an interesting plot of finding out who the person was which kept us guessing till almost the end. The opening sequence was uniquely done but may seemed a bit confusing first, though after a while you would understand it better. The movie's main attraction would definitely be Liam Neeson who already built up a rapport for being an action star even at his age. I pretty much enjoyed the movie as it was truly entertaining though I would have loved it more had the intensity started a lot earlier. Overall it was a good entertaining movie, and one that should be enjoyed as an action thriller film. So if you are a fan of Liam Neeson and want to see his collaboration with Jaume Collet-Sera again, then this should be a definite choice. If you like this kind of genre, you would surely be entertained. And it is worth to note that during this Award period in January where the movie options were limited to heavy drama (or a horror movie), then this could be a good alternate movie.